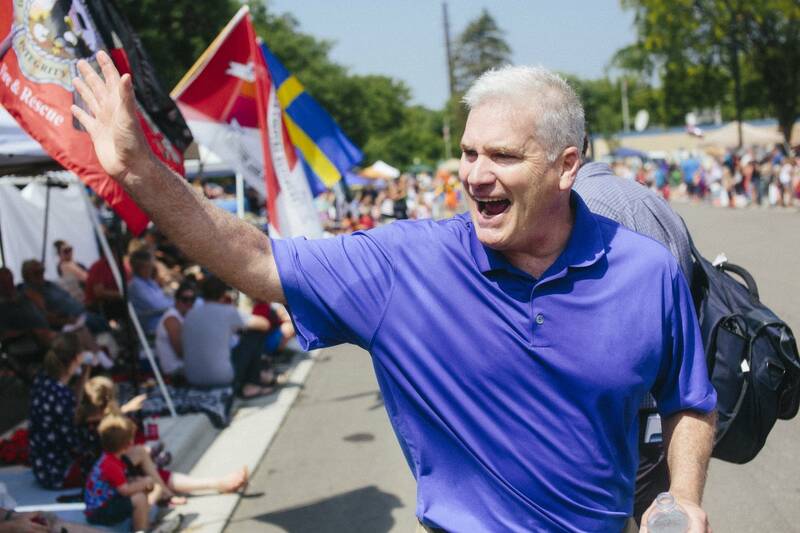 Dressed in khaki shorts and a blue t-shirt and grasping a white face cloth to wipe sweat from his brow, Rep. Tom Emmer jogged much of the Delano parade route, making up time between frequent stops to chat with voters and slap hands with what had to be hundreds of children. The 6th District Republican said constituents are asking him about health care, the impact of immigration and world events on their safety and what they see as unfair attacks on President Trump. Jeff Swenson of Buffalo told Emmer that he believes the federal government's involvement with health insurance should be limited to caring for veterans. "No federal health care," said Swenson. "The constitution does not allow the federal government to be involved in health care." Emmer expects there will be a vote on the Senate health care bill before the August recess. While the nonpartisan CBO said the bill would increase the number of uninsured people by 22 million, Emmer said the bill would not cut off funds to seniors, the working poor and people with disabilities. Republican Jason Lewis marched in the Eagan parade, and DFLer Keith Ellison walked the Edina parade route. Edina residents were also expecting to see Republican Erik Paulsen, but parade organizers say Paulsen was unable to attend because of a family reunion. Instead, protesters upset about Paulsen's vote on health care took his place in the parade. Karen Laumb of St Louis Park was among the members of the group Indivisible CD3 who came to challenge Paulsen's vote in support of the bill that passed the House. "Health care is a right for all," said Laumb. "I'm a cancer survivor and it's so important. I'm really concerned about his vote to support Trumpcare. I beat cancer and I don't want to have to fight my politicians for health care." Paulsen has said he voted for the replacement for the ACA because he says it would control costs and empower states and citizens.